Oh I cant wait! I have this in my TBR pile. Yay! I am so glad it's much longer than Skin Hunger. I love long books!! I wasnt ready for Skin Hunger to end and this one sounds AMAZING! Oooh, Kathleen, good review. Two thumbs up!! Thanks! All the reviews have been wonderful. This one made me really happy because...it's from Hornbook!! Locus included me in their New and Notable books list last issue, too. I am so pleased! i love the bit about the eyedropper! Candy: Me too. It made me laugh and then I thought, yeah, well, it's true. Life doesn't contain a lot of "all is now revealed" moments, so my books don't either. I keep remembering your presentation in Bologna as I redo the website. Interactivity baffles me...My problem: I write books K-all the way up to angst-ridden teens and MANY adults are reading the trilogy. So focus is kind of hard. kathleen, just message me on fb if you have an technical questions! 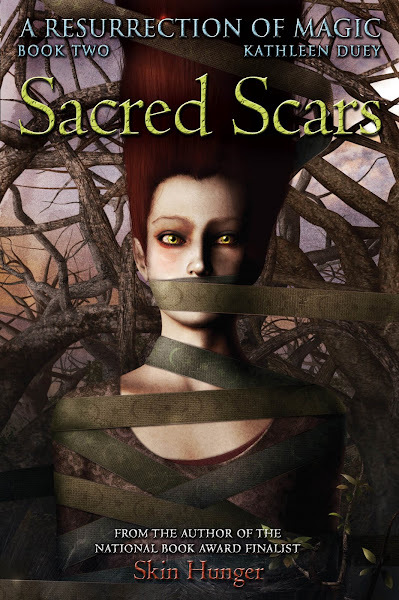 Wow, I've just finished Sacred Scars and I loved it as much as I loved Skin Hunger. 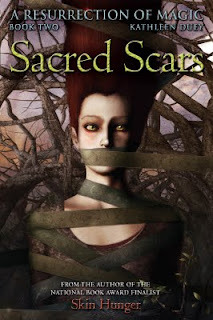 The mysteries keep piling up and I finished Book2 craving for the third volume. The word "exquisitely" just pops, doesn't it? Congrats on this fine review. Thanks, everyone. I do so love this trilogy. I am writing the third one now and will be very sorry to see it end. Also, and equally, relieved.